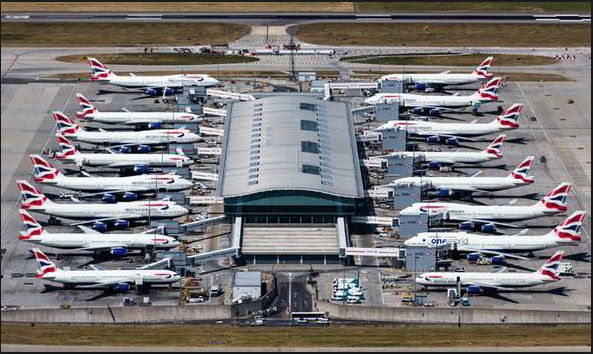 London Heathrow is the third busiest airport in the world. It has only 2 runways, one for takeoff and the other for only landing. Every day at Heathrow 1,400 flights take off and land – one every 45 seconds and nearly half a million per year. How do they manage half a million flights with just 2 runways? Regulation requires 2min delay between two aircraft, but in London, aircraft are routed in different takeoff directions (straight, right and left) to close the gap; one aircraft leaves the runway the other follows in 45 seconds. For landing, in-bound aircraft are held on 4 virtual corkscrew holding pattern 30 miles away from the airport. Every aircraft enters the corkscrew at 15,000ft and spirals down to 7000ft with 1000ft intervals. Then they are guided to enter a single path and approach the runway as little as 4.6 km apart. When one aircraft leaves the holding stack a new aircraft enters the stack. If the stack is full the aircraft are held further away. Until today there are no air traffic control related accidents happened in Heathrow.